I’ve never been a great fan of Spring. Living in the South, I knew all too well that it would last a few weeks, and then we’d be mired in Summer for what seemed like years. Since our move last fall to New York, though, it seems I’ve had a change of heart. I am actually excited about Spring! I stop on the streets and in the parks to take pictures of flowers and blooming trees. I have happily put away my scarves and Ugg boots until cooler weather. This Easter, as I was basking in the early Spring-ness of New York, I decided that our meal should include something befitting of this beautiful season. In an unusual turn of events, I went with a non-chocolate dessert. You’re shocked, I know. This cake features strawberries, and it does so quite boldly, I might add. It is also perhaps the sweetest cake I’ve ever made. Small slices are your friend. It’s absolutely beautiful in all its pink glory. It’s also very sweet. Did I mention that? It was also just the right ending to our Easter meal. While I do like baking from scratch, I’m not one to turn up my nose at a recipe that uses a cake mix. Some of my favorite cakes have started that way. You baking purists may want to move on to the archives and find something else like this or maybe this. 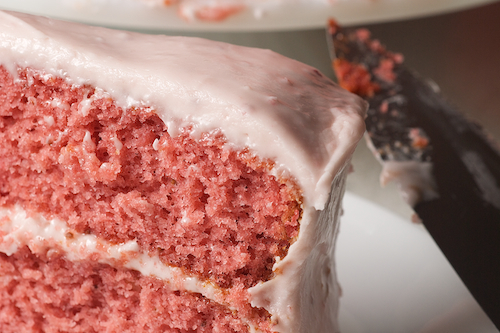 The rest of you, hold your head high and add cake mix, Jell-O, and frozen strawberries to your shopping lists.